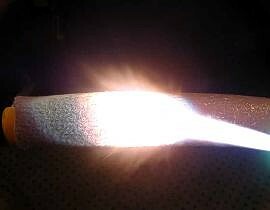 Power cable with FyreJacket sleeving in direct contact with 2800 degree F torch flame for 50 full seconds. 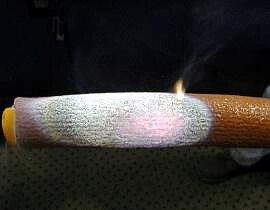 After removal of torch, sleeving is still red hot, and the silicone that impregnates the fiberglass weave of the sleeving has turned to ash. Call 1-800-633-3584 For a Quote Today!